It seems like these days, one can’t visit a Pinterest page or blog without seeing a hundred and one DIY repurposed pallet projects. Pallet gardens, pallet tables, pallet patio furniture, pallet bed frames…there are books devoted to pallet projects! 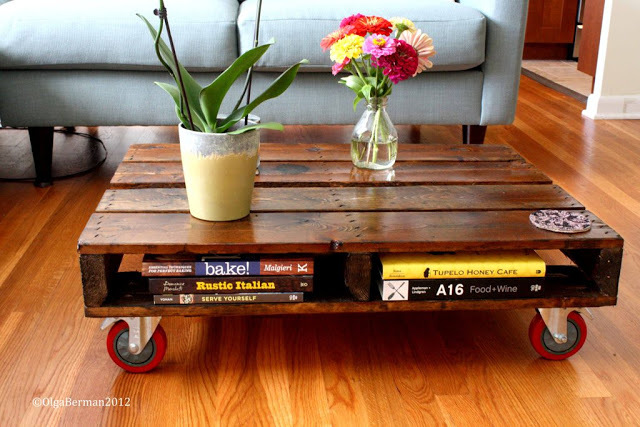 But let’s talk about the fact it seems crafty DIYers are forgetting – that pallet was built for a specific use and a journey, sometimes from around the world, before it was repurposed into a stylish coffee table. Furthermore, the use of pallets has enabled universal pricing to be more affordable, through savings on shipping, labor and other costs. Pallets have been around and in use, some say, as far back as ancient Egypt in the form of slabs; the modern pallet, however, really came into use around the 1920s, coinciding with the growing use of another invention, the forklift. Before forklifts, cargo was carried and shipped the old-fashioned way – by people, stacking boxes one-by-one onto whatever transport they were using. With the dawn of forklifts, merchants modified what was then called a skid (which was like a pallet, but with no bottom supports) into a strong platform with supports, or stringers and deckboards, called a pallet. The addition of stringer supports enabled forklifts to easily maneuver their fork prongs underneath for lifting and moving. The use of pallets in commerce gave merchants the ability to consolidate large amounts of product to a single pallet platform that could be easily moved, loaded onto trucks or ships and even stacked on top of each other. This allowed for more efficient shipping as pallets could be shrink-wrapped and neatly packed into transports, not to mention the savings on the labor required if everything on those pallets had to be packed and unpacked manually several times. The journey of the pallet begins at the lumberyard (although they are also being made from metal, plastic and recycled materials.) Pallets are made from either softwoods, such as pine (best for lighter-load pallets, such as those carrying paper products), or a hardwoods like oak (for more heavy-duty structures.) The pieces are cut from the inner core of the tree after the furniture-grade wood has been removed, or from leftovers at the mill and sent to the manufacturers, where they are assembled either by hand or machine. Once completed, pallets are sold as single-use or are rented, or pooled. Single-use is precisely that – cheaper materials purchased by a company for a one-way ticket. These often end up stacked behind buildings and eventually go to landfills; so obviously, it’s not the most environmentally friendly way to do it. Pooled pallets are more or less rented or leased, usually from either CHEP USA (blue pallets) or PECO (red.) Customers rent them, ship them across the country or even around the world and once their use has finished, they are returned to a local pickup center. From there, they are repaired if need be and rented right back out again. Another form of rental comes from buy/sell programs, in which local companies sell to retailers, who in turn sell them back when they’re done with them. The rental company repairs them and out they go again. This goes on for the duration of the life of the pallet, which at the end is recycled. The end of the lifecycle after a pallet has traversed the globe typically includes getting as much final use out of them as possible by using the boards for spare parts to fix other pallets. If they are simply too far-gone to be repaired, commonly the wood is ground up into wood pulp or mulch.